Maher Gandhi received his medical degree in the UK in 1989, and then trained as a haematologist, including a Fellowship in malignant haematology at Princess Margaret Cancer Centre, Toronto. He was awarded a PhD in immunology at Cambridge University under Patrick Sissons. In 2003 he moved to Brisbane, and works as a Senior Staff Specialist (Pre-Eminent Status) in the Haematology / Oncology Department of the Princess Alexandra Hospital. He leads his own laboratory group and has established an international reputation studying immunity and identification of novel biomarkers in lymphoma, with continuous NHMRC funding since 2005. 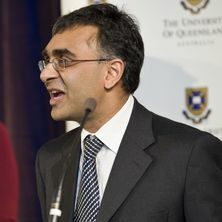 He was Chair of Laboratory Sciences for the Australasian Leukaemia and Lymphoma Group between 2010-2016, won the prestigious Australian Society of Medical Research Clinical Research Award in 2010 and in 2012 took up the inaugural John McCaffrey Cancer Council of Queensland / Office of Health and Medical Research Clinical Research Fellowship. Between 2011-2014 he was privileged to serve as Chair of the Metro South Human Research Ethics Committee. In 2013 he was appointed Professor of Experimental Haematology, University of Queensland, based at the Translational Research Institute, in 2014 became the inaugural Leukaemia Foundation Chair of Blood Cancer Research at the University of Queensland Diamantina Institute, and was appointed Diamantina Cancer Program Head in 2016. From 2018 onwards he has been the Director of Clinical Research at the Mater Research institute at TRI. The research of the Blood Cancer Research Laboratory aims to understand the basis of lymphoma; to devise new treatments which are less toxic and more effective; to establish new biomarkers which will help determine the most effective treatment strategies and to monitor response and relapse and understand the development of lymphomas. The group has a strong emphasis on patient material, which it obtains from international and national clinical collaborators. Lymphomas studied include Hodgkin Lymphoma, PTLD, Diffuse Large B-cell Lymphoma, Follicular Lymphoma and virus associated lymphomas. We utilise a broad range of approaches including genomics, molecular and cellular biology techniques and functional immunoassays. Several of our studies are linked with the Australasian Leukaemia and Lymphoma Group. The Brisbane Girls Grammar School Kirsten Jack Memorial Fund is thanked for their kind support. Green, Michael R., Camilleri, Emily, Gandhi, Maher K. and Griffiths, Lyn R. (2009). Genetic susceptibility to complex traits: moving towards informed analysis of whole-genome screens. In Akio Matsumoto and Mai Nakano (Ed. ), Human genome: features, variations and genetic disorders (pp. 167-180) New York, NY, United States: Nova Science. Ross, Nathan, Gandhi, Maher K. and Nourse, Jamie P. (2013) The Epstein-Barr Virus microRNA BART11-5p targets the early B-cell transcription factor EBF1. American Journal of Blood Research, 3 3: 210-224. Mutsando, Howard, Fahim, Magid, Gill, Devinder S., Hawley, Carmel M., Johnson, David W., Maher, K. Gandhi, Marlton, Paula V., Mar Fan, Helen G. and Mollee, Peter N. (2012) High dose methotrexate and extended hours high-flux hemodialysis for the treatment of primary central nervous system lymphoma in a patient with end stage renal disease. American Journal of Blood Research, 2 1: 66-70. Molecular mechanisms influencing NK cell development: implications for NK cell malignancies. Mujaj, Sally A., Spanevello, Michelle M., Gandhi, Maher K. and Nourse, Jamie P. (2011) Molecular mechanisms influencing NK cell development: implications for NK cell malignancies.. American Journal of Blood Research, 1 1: 34-45. Can a blood test monitor lymphoma? Epstein-Barr virus DNA as a biomarker for Epstein-Barr virus-positive lymphomas: Are we there yet? Gandhi, Maher K. (2009) What changes are needed to the current direction and interpretation of clinical cancer research to meet the needs of the 21st century?. Medical Journal of Australia, 190 8: 461-461. Hourigan, M. J., Mollee, P. N., Gill, D. S., Doecke, J., Norris, D., Johnson, D. W. and Gandhi, M. K.. (2007) The International Prognostic Index: the “gold-standard” in post-transplant lymphoproliferative disorders after renal transplantation. American Journal of Transplantation, 7 399-399. Epstein-Barr virus and advanced chronic lymphocytic leukemia: innocent until proven guilty? Follicular lymphoma: Time for a re-think? Gandhi, MK, Howard, MR and Hamilton, PJ (1996) The Alder-Reilly anomaly in association with the myelodysplastic syndrome. Clinical and Laboratory Haematology, 18 1: 39-40. Gandhi, MK and Chandler, JE (1995) An Unusual Case of Hypersomnolence Syndrome. Clinical and Laboratory Haematology, 17 3: 247-250. Wreghitt, TG, Gandhi, MK, Gray, JJ, Blagdon, J, Rankin, A and Coates, PB (1993) A Case of Transfusion-Acquired Hepatitis-C. Clinical and Laboratory Haematology, 15 2: 141-144. Gandhi, MK, Keidan, AJ, Rees, Jkh, Twentyman, P and Coates, PB (1993) Inducing Remission in Drug-Resistant Acute Myeloid-Leukemia with Cyclosporine-a. Clinical and Laboratory Haematology, 15 3: 219-221. Hertzberg, Mark S., Gandhi, Maher K., Butcher, Belinda, Columbus, Ruth, Taper, John, Trotman, Judith, Gill, Devinder, Ho, Shir-Jing, Fay, Kelth, Cull, Gavin, Grigg, Andrew P., Chong, Geoff, Lewis, Ian D., Milliken, Sam, Renwick, William, Hahn, Uwe, Filshie, Robin, Watson, Anne-Marie, Kannourakis, George, Wolf, Max, Wirth, Andrew, Warburton, Pauline Therese, Larsen, Stephen Robert, Seymour, John F. and Hicks, Rodney (2015). Early Treatment Intensification with R-ICE Chemotherapy Followed By Autologous Stem Cell Transplantation (ASCT) Using Zevalin-BEAM for Patients with Poor Risk Diffuse Large B-Cell Lymphoma (DLBCL) As Identified By Interim PET/CT Scan Performed after Four. In: 57th Annual Meeting of the American Society of Hematology, Orlando, United States, (). Dec 05-08, 2015. Fest, Thierry, Cerhan, James R., Gandhi, Maher K., Azzaoui, Imane, Crooks, Pauline, Maurer, Matthew J., Milpied, Noel, Hertzberg, Mark S., Lamy, Thierry, Ansell, Stephen M., Slager, Susan L., Feldman, Andrew L., Roussel, Mikael, Habermann, Thomas M., Ghesquieres, Herve, Witzig, Thomas E., Link, Brian K. and Rossille, Delphine (2014). Validation of Elevated Blood Soluble PD-L1 As an Independent Prognostic Marker in Newly Diagnosed Diffuse Large B-Cell Lymphoma (DLBCL). In: Abstracts - 56th Annual Meeting of the American Society of Hematology. 56th Annual Meeting of the American Society of Hematology, San Francisco, CA United States, (). 06-09 December 2014. Gandhi, Maher K., Brennan, Rebekah M., Wockner, Leesa, Chattopadhyay, Pratip K., Roederer, Mario, Price, David A., Cole, David K., Hassan, Brekhna, Beck, Konrad, Thornton, Alycia, Gottlieb, David, Ritchie, David, Seymour, John F., Kumarasinghe, Gayathri, Burrows, Scott R. and Jones, Kimberley (2013). HLA-Class I Alleles Impact Susceptibility To EBV+ Classical Hodgkin Lymphoma By Altering EBV Latent Antigen-Specific CD8(+) T-Cell Immune Hierarchies. In: Blood. 55th Annual Meeting of the American-Society-of-Hematology, New Orleans La, (). Dec 07-10, 2013. FOXP1 truncated isoforms differentially regulate target genes in diffuse large B cell lymphoma. Taylor, Emma, Jones, Mark, Hourigan, Matthew J., Johnson, David W., Gill, Devinder S., Isbel, Nicole, Hawley, Carmel M., Marlton, Paula, Gandhi, Maher K., Campbell, Scott B. and Mollee, Peter (2013). Immunosuppression (IST) Can Be Safely Ceased During Chemotherapy For Post-Transplant Lymphoproliferative Disorders (PTLD) In Renal Transplant Patients. In: 55th Annual Meeting of the American Society of Hematology, New Orleans, LA United States, (1780). 7-10 December 2013. Talaulikar, Dipti, Cendales, Yvonne Gonzalez, Shadbolt, Bruce, Gandhi, Maher and Warren, Hilary (2012). Lymphocyte Counts in Patients with B-Cell Non-Hodgkin Lymphoma and Correlation with Fc Gamma Receptor Polymorphisms. In: International Journal of Laboratory Hematology. , , (72-72). .
Modulation of the unfolded protein response via XBP1 splicing: a novel mechanism that regulates Natural Killer cell effector function. Mujaj, Sally, Gandhi, Maher, Vari, Frank and Nourse, Jamie (2012). Modulation of the unfolded protein response via XBP1 splicing: a novel mechanism that regulates Natural Killer cell effector function.. In: Journal of Immunology. 99th Annual Meeting of the American-Association-of-Immunologists, Boston Ma, (). May 04-08, 2012. Camilleri, Emily T., Aya-Bonilla, Carlos A., Brown, Philip J., Banham, Alison, Marlton, Paula, Gandhi, Maher K. and Griffiths, Lyn R. (2012). Identification of FOXP1 Transcriptional Targets in Diffuse Large B Cell Lymphoma. In: ASH Annual Meeting Abstracts. 54th Annual Meeting and Exposition of the American Society of Hematology (ASH), Atlanta, GA, United States, (). 8-11 December 2012. Huyen Tran, , Nourse, Jamie P., Lea, Rod, Brighton, Timothy A., Grigg, Andrew, McRae, Simon, Thurley, Daniel, Gandhi, Maher and Catalano, John (2011). A Multi-Centre, Single-Arm, Open-Label Study Evaluating the Safety and Efficacy of Fixed Dose Rituximab in Patients with Refractory, Relapsing or Chronic Idiopathic Thrombocytopenic Purpura (R-ITP1000 Study) and Exploring Rituximab Response with the FcGammaR3A Polymorphisms. In: 53rd Annual Meeting and Exposition of the American-Society-of-Hematology (ASH)/Symposium on the Basic Science of Hemostasis and Thrombosis, San Diego Ca, (523-524). Dec 10-13, 2011. Nourse, Jamie P., Crooks, Pauline, Van, Do Nguyen, Jones, Kimberley, Ross, Nathan and Gandhi, Maher K. (2009). EBV MicroRNA Expression in Virus Driven B-Cell Differentiation and Lymphomagenesis. In: 51st Annual Meeting of the American-Society-of-Hematology, New Orleans La, (43-43). Dec 05-08, 2009. Jones, Kimberley, Nourse, J., Crooks, P., Gottlieb, D. and Gandhi, Mahei (2009). Cell-free Epstein-Barr Virus DNA is a Specific Biomarker for Tumor Burden in EBV-associated Lymphomas. In: Journal of Immunotherapy. 24th Annual Meeting of the International-Society-for-Biology-Therapy-of-Cancer, Washington Dc, (1011-1011). Oct 29-31, 2009. Jones, Kimberley, Vari, Frank, Khanna, Rajiv, Han, Erica, Singh, Sanjleena, Ritchie, David and Gandhi, Maher K. (2009). Epstein-Barr Virus-specific T Cells as Therapy for Relapsed/Refractory EBV-positive Lymphomas. In: Journal of Immunotherapy. 24th Annual Meeting of the International-Society-for-Biology-Therapy-of-Cancer, Washington Dc, (944-945). Oct 29-31, 2009. Jones, Kimberley, Nouise, J., Morrison, L., Vari, Frank, Moss, D. and Gandhi, Mahei K. (2009). Mechanisms Underlying the Selective Impairment of Epstein Barr Virus-Nuclear Antigen I-specific Effector T Cells Observed in PTLD. In: Journal of Immunotherapy. 24th Annual Meeting of the International-Society-for-Biology-Therapy-of-Cancer, Washington Dc, (1011-1012). Oct 29-31, 2009. Nourse, P., Jones, K., Crooks, P. and Gandhi, M. K. (2009). Ebv Microrna Expression in An In-Vitro Model of B-Cell Differentiation and Lymphomagenesis. In: Haematologica-The Hematology Journal. 14th Annual Meeting of the European-Hematology-Association, Berlin Germany, (221-222). Jun 04-07, 2009. Mollee, P, Hourigan, M, Johnson, D, Jones, M, Isabel, N, Hawley, C, Marlton, P, Gandhi, M, Campbell, S and Gill, D (2007). Immunosuppression (IST) can be safely ceased during chemotherapy for PTLD in renal transplant patients. In: Blood. 49th Annual Meeting of the American-Society-of-Hematology, Atlanta Ga, (410A-411A). Dec 08-11, 2007. Gandhi, M, Lambley, E, Marlton, P, Gill, D, Seymour, J, Wolf, M, Prince, M, Elliott, S and Khanna, R (2005). LAG-3 expressing lymphocytes suppress EBV latent membrane protein-specific T cell function in Hodgkins lymphoma patients. In: Annals of Oncology. 9th International Conference on Malignant Lymphoma, Lugano Switzerland, (84-85). Jun 09-11, 2005. Identification of novel proteins associated with the Mpl cytoplasmic domain. Gandhi, M and Drachman, JG (2001). Identification of novel proteins associated with the Mpl cytoplasmic domain.. In: , , (288A-288A). . Significant and persistant loss of bone mineral density (BMD) in the femoral neck after haematopoietic stem cell transplantation: A prospective study. Gandhi, MK, Lekamwasam, S, Inman, , Kaptoge, S, Sizer, L, Love, S, Craig, JIO, Marcus, RE and Compston, J (2001). Significant and persistant loss of bone mineral density (BMD) in the femoral neck after haematopoietic stem cell transplantation: A prospective study.. In: , , (365B-365B). .
Changes in the clonal composition of CMV-specific CD8+ cytotoxic T-lymphocytes (CTL) between allogeneic stem cell transplant recipients and their donors. Gandhi, MK, Willis, MR, Craig, JIO, Marcus, RE, Sissons, JP and Carmichael, AJ (2001). Changes in the clonal composition of CMV-specific CD8+ cytotoxic T-lymphocytes (CTL) between allogeneic stem cell transplant recipients and their donors.. In: Blood. , , (357B-357B). . The clonal reconstitution of human cytomegalovirus-specific memory cytotoxic T-lymphocytes following allogeneic stem cell transplantation. Gandhi, MK, Carmichael, AJ, Wills, MR, Craig, JIO, Marcus, RE and Sissons, JP (2000). The clonal reconstitution of human cytomegalovirus-specific memory cytotoxic T-lymphocytes following allogeneic stem cell transplantation.. In: Blood. , , (789A-789A). . Influenza vaccination is ineffective in the first 2 years after stem cell transplant. Gandhi, MK, Egner, W, Inman, I, Craig, JIO and Marcus, RE (1999). Influenza vaccination is ineffective in the first 2 years after stem cell transplant.. In: British Journal of Haematology. , , (31-31). .
A case controlled comparison between CD34(+) cell selected and unselected autologous PBSCT for multiple myeloma. Gandhi, MK, Jestice, HK, Scott, MA, Bloxham, DM, Bass, G, Craig, J and Marcus, RE (1999). A case controlled comparison between CD34(+) cell selected and unselected autologous PBSCT for multiple myeloma.. In: Bone Marrow Transplantation. , , (S136-S136). . Reduced bone mineral density (BMD) in males and females after bone marrow transplant (BMT). Gandhi, MK, Sizer, L, Compston, JE, Prevost, A and Marcus, RE (1998). Reduced bone mineral density (BMD) in males and females after bone marrow transplant (BMT).. In: British Journal of Haematology. , , (28-28). .
Allogeneic peripheral blood progenitor cell transplantation: A case controlled study of GVHD. Scott, MA, Gandhi, MK, Jestice, HK, Mahendra, P and Marcus, RE (1998). Allogeneic peripheral blood progenitor cell transplantation: A case controlled study of GVHD.. In: Bone Marrow Transplantation. , , (S114-S114). .
Febrile neutropenia after hematopoietic stem cell mobilization with chemotherapy and G-CSF does not affect collection of adequate numbers of CD34+ cells. Yee, K, Tu, JV, MacKinnon, J, Gandhi, M, Stewart, AK, Saragosa, R, Keating, A and Crump, M (1997). Febrile neutropenia after hematopoietic stem cell mobilization with chemotherapy and G-CSF does not affect collection of adequate numbers of CD34+ cells.. In: Blood. , , (943-943). .
Simpson, DR, Gandhi, MK, Stewart, AK, Crump, M and Keating, A (1997). Autologous marrow and/or blood cell transplantation (ABMT) for follicular large cell lymphoma (FLC). In: Experimental Hematology. , , (415-415). .
Yee, K, Tu, JV, MacKinnon, J, Gandhi, M, Stewart, AK, Saragosa, R, Keating, A and Crump, M (1997). Febrile neutropenia does not affect collection of adequate CD34+ cells after mobilization with chemotherapy and G-CSF. In: Experimental Hematology. , , (310-310). .
Gandhi, MK, Simpson, D, Yee, K, MacKinnon, J, Stewart, AK, Crump, M and Keating, A (1997). Pre-autologous bone marrow transplant (ABMT) screening for HLA antibodies does not predict for platelet alloimmunization post-ABMT: A case controlled study. In: Experimental Hematology. , , (302-302). .
Qualitative difference in CD34 counts in multiple myeloma (MM) and breast cancer (BCa) patient (PT) stem cell grafts. Simpson, DR, Gandhi, MK, Stewart, AK, Crump, M and Keating, A (1997). Qualitative difference in CD34 counts in multiple myeloma (MM) and breast cancer (BCa) patient (PT) stem cell grafts.. In: Experimental Hematology. , , (425-425). .
A multicentre study of granulocyte-macrophage colony stimulating factor (GM-CSF) in combination with consolidation therapy in adult acute myeloid leukemia (AML). Keating, A, Gandhi, MK, Crump, M, Smith, A, Belch, A and Baker, MA (1996). A multicentre study of granulocyte-macrophage colony stimulating factor (GM-CSF) in combination with consolidation therapy in adult acute myeloid leukemia (AML).. In: Blood. , , (832-832). . Treatment of acute myeloid leukemia (AML) at diagnosis in 99 unselected adults with high dose ARA-C (HIDAC) and mitoxantrone: Long-term follow-up. Keating, A, Gandhi, MK, Crump, M, Smith, A, Belch, A and Baker, MA (1996). Treatment of acute myeloid leukemia (AML) at diagnosis in 99 unselected adults with high dose ARA-C (HIDAC) and mitoxantrone: Long-term follow-up.. In: Blood. , , (833-833). .
Hall, AG, Rabello, C, Jackson, G, Gandhi, MK and OBrien, H (1996). Congenital deficiency of thiopurine methyltransferase as a cause of pancytopenia in patients treated with azathioprine. In: British Journal of Haematology. , , (789-789). .